Celebrate the place you work hard to call home. 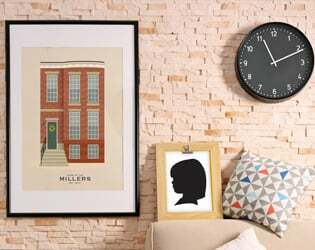 Display a series of all the places you’ve called home! Take $10 off additional house portraits. Add $15 to receive an 8×10 archival print. for crisp details and a water repellent finish. 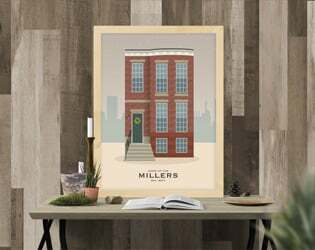 shop 8×10 frames on Amazon. Save on more than one. Take $5 off additional silhouettes. shop 5×7 frames on Amazon. 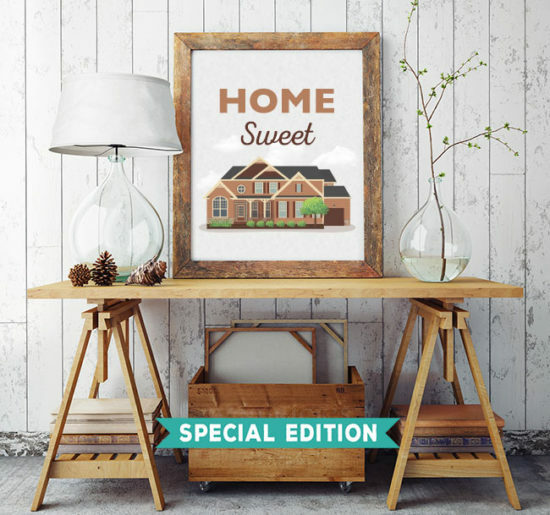 Real Estate Professionals: Giving a portrait as a closing gift? Email me for full-service printing, framing and shipping options to deliver direct to your client. All of these additional customizations are available at no extra charge! Just note which ones you want when you place your order. Customize your caption, or add an additional message. Hi there! I’m Angela. My family and I live in rural northwestern Pennsylvania in a small town with a lot of farms, and even more snow. Some might see it as a simple life but to us it’s rich with love and opportunities to learn and form close friendships. 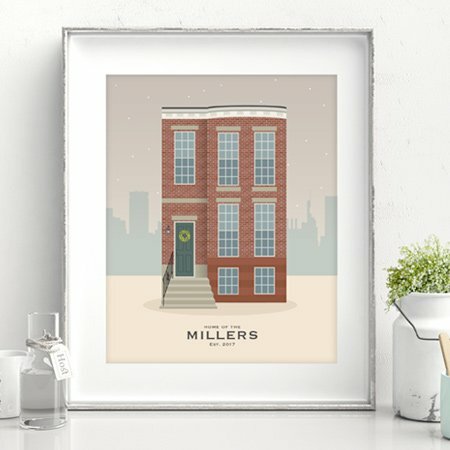 After creating commercial artwork for more than 15 years, I decided to use those same skills to create personalized portraits for people’s homes. I use a digital pallet of textures, color swatches and shapes to construct each portrait, referencing a photo. 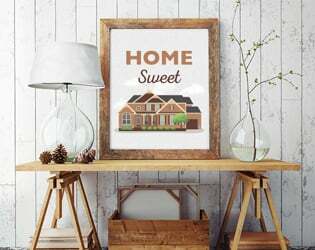 It’s an honor to be able to create personalized artwork to warm up people’s homes with decor that is truly meaningful. Feel free to email me with any questions you might have about the ordering or portrait-making process. Learn more about me & this blog, Mighty Mrs.
Home portrait: A photo of the home. Don’t have a photo? Grab one from Google Maps. 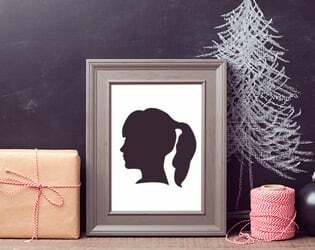 Silhouettes: A side profile photo including head and shoulders. 3.) You will receive an emailed confirmation of your order within 24 hours and an invoice following that. 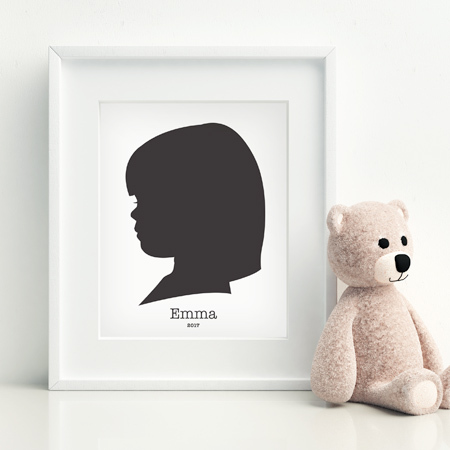 Delivery: Please allow 1 week for home portraits and 1-3 business days for silhouettes proofs. 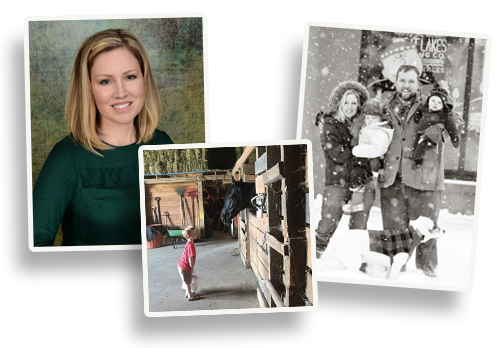 Your final portrait will be delivered as a printable digital file or if you order prints, they will be mailed to you. 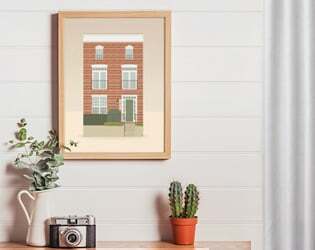 Framing is up to your personal taste and budget, recommendations above. In a rush? Please specify when you need the portrait and I will try to accommodate. 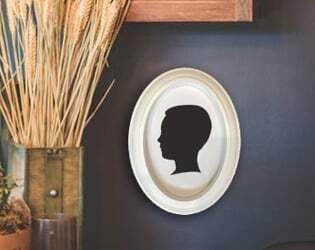 Money-back guarantee: If you are not happy with your house portrait or silhouette, you may request a refund after viewing your proof. Your money will be returned without a hassle. Please note color may vary from screen to printer. Got it? Great! Order below. Confused or having trouble? 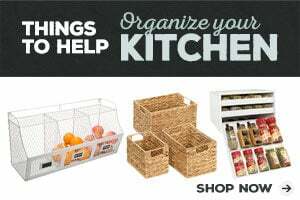 Email me your order!